The MRPC Annual Meeting will take place in Memphis, September 17-19. Mark your calendar and donâ€™t miss this important meeting. Registration will open in July. The hotel for the meeting will be Springhill Suites in downtown Memphis, the same location as the 2009 meeting. The room rate is $125 per night and includes breakfast. To make your reservation, call 800-593-6415 or 901-522-2100. Last monthâ€™s Semi-Annual Meeting in Alton, IL was quite productive. The meeting took place at different attractions throughout the Alton area, including The National Great Rivers Research and Education Center, Lewis & Clark Interpretive Center, Lewis & Clark Confluence Tower, the Melvin Price Locks & Dam, the Audubon Center and Riverlands Migratory Bird Sanctuary. At the National Great Rivers Museum, one of the 75 official Great River Road Interpretive Centers, the MRPC delivered new signage. It was a great photo op. As part of the meeting, we continued to develop our Mississippi River Connections partnership through National Geographic. Terry Easton, president of Mississippi Trails, Inc., gave a presentation, and MRPC members were able to ask questions. As a result of that meeting and subsequent discussions in technical committee meetings, the MRPC signed an addendum to the memorandum of understanding. This further cemented our partnership and commitment to the project. Stay tuned for details on the next steps. At the final eveningâ€™s reception and dinner, the MRPC met with members of a long list of organizations whose missions are directly related to the Mississippi River. These organizations included the Army Corps of Engineers; Inland Rivers, Ports & Terminals Association; Delta Regional Authority; Mississippi River Commission; U.S. Environmental Association; Upper Mississippi River Basin Association; Mississippi Rivers and Towns Initiative; Waterways Council, Inc.; National Audubon Society; Upper Mississippi, Illinois & Missouri Rivers Association; Mississippi Valley Flood Control Association; American Association of Community Colleges; Mississippi River Transportation, Distribution and Logistics Consortium; and the Illinois Department of Transportation. The MRPC is halfway through its current strategic plan, a large component of which is the development of partnerships. This past Semi-Annual Meeting goes a long way to furthering that aspect of the plan. Overall, it was a work-filled meeting that really moved the mission forward. Thank you to everyone in Illinois who helped to make this meeting one of the most productive in memory. In particular, we thank Dale Chapman, Craig Mitckes, Holly Cain and Nani Bhowmik. The MRPC finally has the new signs, both the overlays for existing signs as well as new poles and signs for new Interpretive Centers. Click here for directions on how to adhere the overlays. The National Office has created a media release template about the new signs. The new signs are an excellent opportunity to generate publicity for the MRPC and the Great River Road Interpretive Centers. If you have any questions, contact the National Office. This will be our second year for the Drive the Great River Road month promotion. September was selected as the ideal month for the promotion due to the beautiful fall scenery found along much of the Great River Road, numerous fall events, relatively good driving weather and the fact that fall is a shoulder season for much of the Great River Road. This yearâ€™s promotion will involve a trivia contest with questions based on the Interpretive Centers. Look for details to come. The Iowa MRPC recently published the results of a resident survey. The results shed light on travel habits as well as travelersâ€™ views of the Great River Road. For example, 65% of Iowa Great River Road visitors are either â€œsomewhatâ€ or â€œvery muchâ€ aware of the Iowa Great River Road. A whopping 96% of all visitors said their trip met or exceeded their expectations. A total of 70% of Great River Road visitors are repeat visitors and 67% of repeat visitors feel that the area has changed for the better. These are just a few of the fascinating insights offered by this survey. View the survey results. 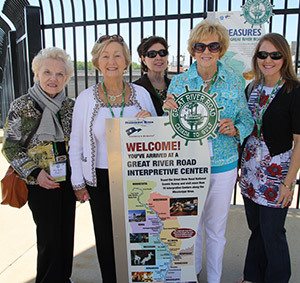 Last year, the MRPC received more than $1.1 million in earned media mentioning the 75th anniversary of the MRPC and Drive the Great River Road month. Last yearâ€™s Drive the Great River Road sweepstakes received 2,300 entries, increased the MRPCâ€™s Facebook fans by 74% and increased Facebook engagement by 836%. Recent media coverage about the Great River Road includes an article in the Smithsonian Magazine. We also made USA Today's bucket list. The MRPCâ€™s Great River Road Facebook page has more than 8,000 fans. The Facebook page is a great way to find out whatâ€™s happening along the 10-state byway, from events to new attractions. The National Office posts to the Facebook page at least three times per week. However, for the page to reach its full potential, like you need to post about your stateâ€™s tourism offerings. The National Office also established Youtube and Pinterest pages for the Great River Road in 2013. These are the perfect place to post your great new photos and video clips.